Located at a distance of 36 km from the popular town of Ukhimath, Madhyamaheshwar is an ancient shrine dedicated to Lord Shiva; it is situated at the base of the Chaukhamba peak of the Garhwal range. Situated at an altitude of 3,497 m, the shrine is one amongst the Panch Kedars or the five holy shrines of Shiva in the Himalayan ranges, which are believed to be built by the Pandavas. The temple can be reached only by trekking, which starts from the village of Uniana; Uniana is about 19 km away from the shrine. The trek to the shrine is moderate in nature and takes you through the lush green alpine meadows on one hand and dense forests on the other along with the snow-covered Himalayas adding a white background. Due to its high altitude location, the shrine is open only for 6 months in a year. The shrine opens its doors in the month of May and closes its doors in the first week of November. By Air: The nearest airport is the Jolly Grant Airport at Dehradun which is located at a distance of 110 km from here. The airport is well connected to most of the major airports across the country, such as Delhi, Bengaluru, Kolkata, Mumbai, etc. By Train: The nearest major railhead is the Rishikesh station which is located at a distance of 140 km from here. The station receives trains from a number of major towns and cities across the country. By Road: Ukhimath is considered the base camp for the trek, after which one has to trek to reach the shrine. There are a number of bus services from Rudraprayag to Ukhimath and taxis which operate on the route. The total driving distance from Delhi to Ukhimath is about 422 km which would take you about 11 to 12 h to reach the place. Further one needs to trek for about 16 to 20 km to reach the shrine of Madhyamaheshwar. Haridwar is one of the oldest and holiest cities in the country. It is considered as one of the seven holiest places amongst the Hindus and is also the site of the Kumbha Mela, which happens once in 12 years. The place is home to numerous temples and ghats which are located on the banks of river Ganga. The Ganga touches the plains here first before making her way towards the Bay of Bengal. Haridwar is also the gateway to the Char Dham Yatra which comprises of a pilgrimage to the shrines of Badrinath, Kedarnath, Gangotri and Yamunotri. The evening Ganga aarti is a must watch when here, the places not to be missed here are Har ki Pauri, Chandi Devi Temple, Mansa Devi temple, Bharat Mata Temple, etc. The shrine is believed to have been constructed by the second Pandava Prince Bhima, who worshipped Shiva in order to wash away his sins of killing his cousins, the Kauravas and Brahmahatya, and killing Brahmins during the Mahabharata War. The temple is constructed in the Nagara style of architecture and finds its place on a green meadow, below a high ridge. An interesting factor is that like most other temples in the region, the priests here are from Karnataka and the member of Lingayat community, who hail from Mysore. 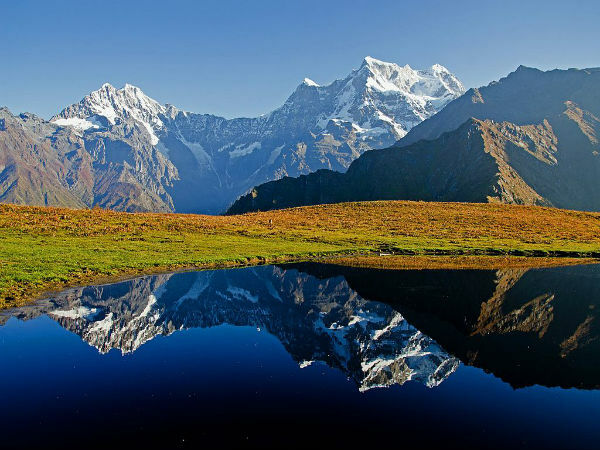 Further, if you would trek for another 2 km, you would reach a small lake from where you would get a breathtaking view of the Himalayan ranges along with its several peaks.